Visual artist, D. Hill, is a trans man breaking down the barriers of gender through art and self-expression. The LGBT Center had the chance to catch up with him and ask a few questions about TRAN(S)junction (which was exhibited in the Offsite Gallery of the World Trade Center in Norfolk), his life, his art, as well as his struggles. Tell us about the type of art you produce. What’s your philosophy about your work? : I create conceptual videos, photographs and performance art that is centered around gender fluidity. I say conceptual because I purposely want to invite the viewer to think beyond the object and more about the meaning. My philosophy is always to apply my personal experience and then work outwardly. The more honest I am through my art work, the more of an impact it has on the viewer. When I view artists work such as Zachary Drucker, A.L. Steiner, Wu Tsang, Jacolby Satterwhite, Mark Bradford, Glenn Ligion and Kalup Linzy, I get excited about telling my truth and exploring whichever medium best conveys the message. 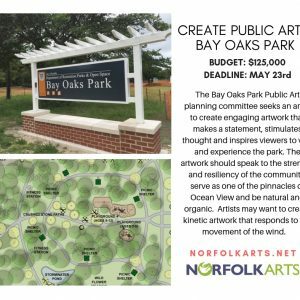 You did a Kickstarter to help put your project in the Offsite Norfolk Art Gallery–can you tell us about how that went? : I started a Kickstarter for two reasons: to fund the art materials needed for the exhibition and to participate in the art community on Kickstarter. Crowd funding allows art appreciators to donate to a common cause and help spread the word about existing sub-cultures. My Kickstarter was a success and met its goal within… read more.